Ever. This recipe is taken from Quick Vegetarian Pleasures by Jeanne Lemlin. Someday I'll become cook and baker enough to throw together my own recipes but until then, I scrounge others'. My mom recommended this book and told me this really was the best chocolate cake. I have used this recipe for - hm - maybe seven years. Almost impossible to wreck. Have a go. 1. Preheat the oven to 350 F. Wait 10 minutes before starting to make the cake. Meanwhile, butter and flour 2 8-inch layer pans and set aside. When the 10 minutes are up, thoroughly combine the flour, sugar, cocoa, baking soda, and salt in a bowl. 2. Pour in the water, oil, vanilla, and vinegar and stir until well combined. Pour into the prepared pans. Bake 30 minutes or until a knife inserted in the center of the cake comes out clean. Cool on a wire rack 10 minutes, then remove the cakes from the pans and cool completely. 3. To make the buttercream: Melt the chocolate in a double boiler, then remove the top pan. Let the chocolate cool until tepid. In a medium bowl, cream the butter, using an electric mixer. Add the egg and beat until blended but now smooth. Pour in the chocolate and beat until just combined. 4. When the cake is completely cool, spread some icing on one layer. Top with the other layer, then spread the remaining icing all over the cake. Chill the cake at least 30 minutes, then bring to room temperature before serving. Suggestions & Modifications: Let's see. I use canola oil instead of vegetable oil. I also sift the cocoa. And I blend the wet ingredients before mixing them with the dry (I don't think it really matters). I also like to use a mix of semisweet and dark or all dark (70 - 80%) chocolate for the icing. 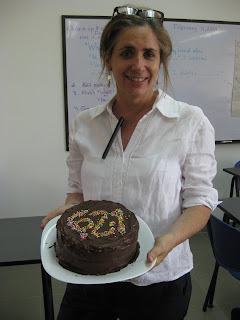 Here's a picture of The Best Chocolate Cake, served as a Benchmark Cake for my English department chair's presentation. She told us about the grade 6 Language Arts Standard 2 Benchmark 1. Hence the blurry sprinkles 6.2.1. Please, please do not submit this to cakewrecks. Learning how to ice a cake without slobbering icing all over the plate is still on my list of things to do. Yummm. Given that I have been eating chocolate chips by the handful lately, this is right up my alley. Re: the middle east. I only spent 3.5 weeks there back in 2004 for work. I was in Kuwait, Qatar, and Jordan. It was an eye-opening experience that really made me appreciate being a woman in the U.S. It was tough to have meetings with men that wouldn't acknowledge me or even look at my face and to have to cover up my arms and legs and think about how I was being perceived. All my running was done on the treadmill given that it was not very safe at that time. The hotel that we stayed at in Jordan was bombed several weeks later. In Kuwait, we were on an ex-pat compound, so I didn't have much exposure to the area. We were there during Ramadan...which was interesting. I couldn't even drink water in the car during the day, let alone consume food in a public place. I am sure that you will find your own little enclave at th school.